Posted on 7, March 2018 by EuropaWire PR Editors | This entry was posted in Business, Germany, Technology and tagged Beat Weibel, EPO, INNOVATION, inventions, patent applications, Patents, Siemens. Bookmark the permalink. MUNICH, 07-Mar-2018 — /EuropaWire/ — Siemens – followed by Robert Bosch and BASF – submitted more European patent applications than any other German company in fiscal 2017. 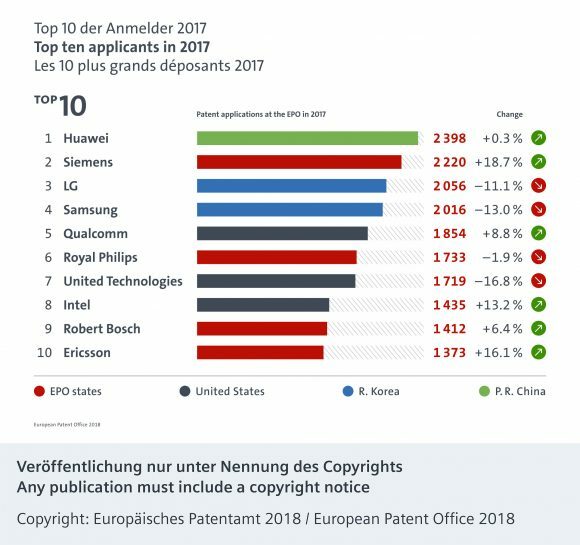 In addition, among companies worldwide that filed European patent applications in 2017, Siemens advanced from sixth to second place, after the Chinese company Huawei, which was ranked No. 1 for the first time. In 2017, Siemens filed patent applications in Europe for 2,220 inventions – about 19 percent more than in the previous year, representing a greater increase than was achieved by any other company among the top ten. The European Patent Office (EPO) published the latest statistics today in Brussels. Siemens holds a total of 63,000 patents worldwide. The company’s employees submitted around 7,450 invention disclosure reports in fiscal 2017. Based on 220 workdays a year, this represents an average of about 34 inventions per day.